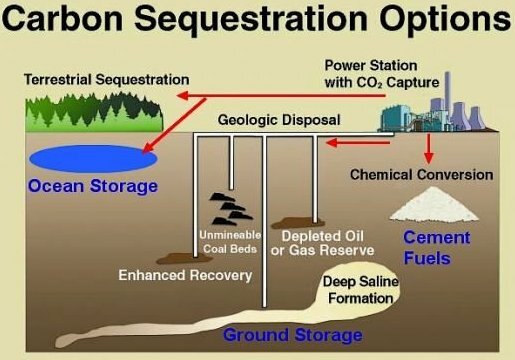 This post we will discuss about carbon capture sequestration and reuse. The basics, first things first, climate change is largely due to carbon dioxide, but why? because we burn lots of natural gases and coal and power plants, and gasoline in cars. The emissions that go into the atmosphere and stay there heating a planet. So what can you do? One solution is to use energy sources like solar, wind and possibly nuclear, and use them more efficiently. With the United Nations projecting 9 billion people in 2050, 2.2 billion more than today. And a predominance of coal resources worldwide. We can't ignore that fossil fuels are going to continue to be used. So what else can we do? Well here's where carbon capture sequestration and see you to reuse come in. But what is that stuff? And more importantly, how do we do it? In this post, we will learn about some of the methods to capture store and reuse CO2. Carbon is a good source of energy that sustains life on earth. All creatures from humans to corn crops to soil bacteria require it in one form or another. A finite amount of carbon molecules are cycled throughout the planet in various forms. In addition to being a building block of organisms such as plants and animals, carbon can be found as a gas in the atmosphere, dissolved in oceans lakes and rivers, and bound up in complex compounds of decomposed material in the soil, called humus. Carbon also occurs in forms that are considered less accessible to living organisms. This kind of carbon, informly called old carbon, is found at the bottom of the ocean and in rocks deep below the surface of the earth. In order to understand how humans interact with the carbon cycle on land. It is first necessary to take apart how different forms of carbon movement, from one pool to another. Plants living on land assimilate carbon dioxide from the atmosphere and use it to build and store plant material in a process known as photosynthesis. As they grow and maintain themselves, plants release both oxygen and carbon dioxide into the atmosphere through respiration. Carbon dioxide is also released when animals respire in order for the planet to have enough carbon currency to support an ever increasing human population. Soil contains the largest biologically available pool of carbon on the planet. The carbon that gives soil a rich dark color, commonly known as humus, has long been recognized as one of the most important natural resources available to humans. Without humus , the crops that we depend on could not grow and obtain nutrition. Soil carbon is also the resource that humans most often take for granted. Conventional agricultural practices such as crop harvesting, frequent tillage, and heavy fertilizer application remove significant amounts of this useful carbon from the soil through increased decomposition and soil erosion. Carbon released from these practices enters the atmosphere and contributes to global climate change. Scientists are increasingly realizing that a cheap beneficial way to reduce carbon emissions lies just below the surface. Think of it, this way, carbon in the soil humus can remain there for hundreds of thousands of years. Given the magnitude of carbon in the soil pool, even if 6-7% more carbon can be retained in soil humus through better land management practices. We can offset the amount of carbon being burned through fossil fuels, reducing the intensity of global warming. In addition, increased soil humus promotes greater crop production, water retention, nutrient cycling, and soil decomposer biodiversity. We've got carbon sequestration which is the act of safely storing carbon away from the atmosphere. What we just saw is called geologic sequestration, similarly, there's a sub seafloor sequestration. Well lots of s isn't that one. There's even something called Rock sequestration. Most of the CO2 will have to be stored, but some of it will be able to be reused successfully. One possibly reuse is paper filler. Another is house building materials, and even something called solar gasoline. 1 Response to "Carbon Sequestration in Soil"